Venue: No. 8 Café, Westgate Street, Launceston (no.6 on the Festival venues map ). Please note : there are 10 steps up to the Festival event area, and there is no wheelchair access. 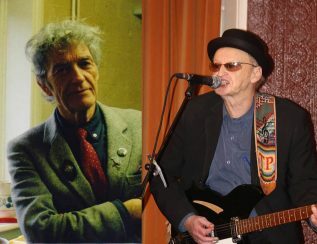 An inspired double-bill of hipster, pop-poet and regular columnist of ‘Peace News’ Jeff Cloves, and the UK’s premier exponent of the 12-string electric guitar, singer-songwriter Tony Poole, founder-member of folk-rock band Starry Eyed & Laughing. Protest songs for today, with the spirit of the 1960s beat generation: expect the odd Dylan and Byrds song, too! Pre-gig food will be available at No. 8 Cafe from 5.00pm.